The super-slim 12-inch Apple MacBook brought a radical design change to laptops with its USB Type-C port, but it won't support faster Thunderbolt 3 data transfers. Intel at Computex announced Thunderbolt 3 that can transfer data between computers and external peripherals at speeds of 40Gbps, the fastest among connector technologies today. The technology is two times faster than its predecessor, Thunderbolt 2, which is in many Macs today. The biggest changes in Thunderbolt 3 is support for the USB protocol and a move away from proprietary connectors to souped-up USB Type-C ports and cables. Computers could have similar looking USB Type-C and Thunderbolt ports, the latter distinguished by the Thunderbolt logo. The Thunderbolt 3 cable will plug into the USB Type-C ports in the new MacBook and Pixel, but will operate on the USB 3.0 protocol and transfer data at speeds of 5Gbps. The laptops won't support faster Thunderbolt data transfers of 40Gbps, according to Jason Ziller, director of marketing at Intel, during an event at Computex to explain Thunderbolt 3 technology. Faster controllers need to be installed in Macs and PCs to achieve Thunderbolt 3 speeds, and users will likely have to wait until the release of new laptops to get the technology. Thunderbolt 3 is designed for Intel's Skylake chips, which will ship in the second half, and 30 laptops and desktops supporting the connector technology are expected to ship by the end of the year. So users can expect Thunderbolt 3 ports to appear in Skylake-based Macs. Apple has Thunderbolt in most of its Macs, but the company's decision to include only a USB Type-C port in the 12-inch MacBook raised questions about Thunderbolt's future. But Thunderbolt 3 has support for the best traits of USB, and Apple could bring back a Thunderbolt 3 port in the next 12-inch MacBook. Users will be able to charge laptops with Thunderbolt 3, which will be able to carry up to 100 watts of power. The faster pipes in Thunderbolt 3 will allow two 4K monitors to be connected to a computer simultaneously. Users will be able to transfer a 4K movie from an external storage device to a PC in 30 seconds, Ziller said. The base Thunderbolt 3 technology could support two DisplayPort 1.2 display connections. Additionally, it will also work with 10-Gigabit Ethernet, and support the PCI-Express data transfer protocol. 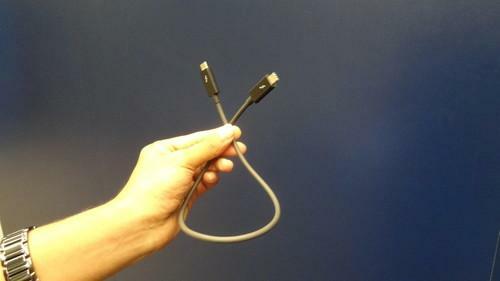 Previous versions of Thunderbolt were not successful because of the proprietary connector technology and high cost. Only about a hundred peripherals support older Thunderbolt technologies. But with support for USB -- which is dominant in PCs, mobile devices and electronics -- Thunderbolt 3.0 is now capable of supporting millions of peripherals. Intel is working on cables so older Thunderbolt peripherals can connect to new Thunderbolt 3 ports. 8K video could be a key potential application for Thunderbolt 3, as it will require a lot more bandwidth than available with USB 3.1 today.